Who says you can’t wear white after Labor Day? For the fourth year in a row, treats! 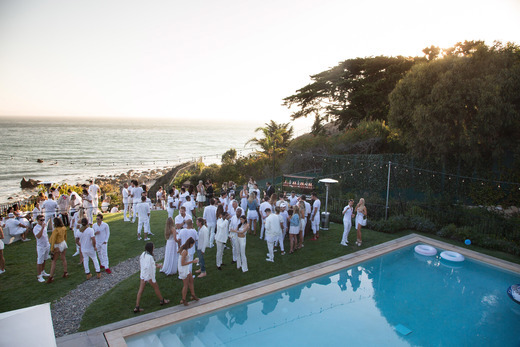 hosted a luxurious all-white dress code party in Malibu with a beautiful background of the Pacific Ocean, celebrating people in fields of art, fashion, music and entertainment. While the party started out with a chill Malibu vibe, it soon picked up as the DJ started spinning and guests began to arrive. Everyone enjoyed cold beers and a variety of other drinks out of their iconic Stella Artois chalices. Early arrivals included “WAGS” star Nicole Williams and beau Larry English and Nick Simmons, who enjoyed the stunning view of the Malibu coast. Many known models like Tika Camaj arrived wearing Indah dresses and For Love & Lemons in the trend of lace and bell sleeves in white and ivory. Most models were in bright white lace and stood out significantly. British fashion designer Julia Clancey wore a stunning and statement-making dress and head piece emblazoned with fine jewels and crystals. Sofia Richie got into the theme of the event wearing a white t-shirt dress with the word “white” on the back, paired with white high tops and sunglasses. It was an edgy street style look that fitted with the relaxed vibe of the beach side event. She attended with a male friend and was seen reading a copy of treats! Magazine and enjoying the beautiful grounds of the stunning property. Later on in the evening, Brody Jenner and Frankie Delgado, strolled in and joked around enjoying the laid back pool vibes and stunning view. Absolute Elyx also served up Moscow mules to the thirsty guests including Steve Shaw, treats! Editor and founder, who was entertaining friends and guests including pal Spencer Garratt and Singer Matt Bellamy (MUSE) and his girlfriend, model Elle Evans. Foster The People’s Mark Foster got in the party spirit and playfully photo bombed some of guests! Treats! Magazine is known for its glitzy events and always attracting a beautiful fun loving crowd. Treats! Magazine is an artistic magazine released quarterly that celebrates the natural beauty of women in a sensual, sophisticated and unique way.